Slate: Create Your Own Marriage Ruling - Joe.My.God. These judges know this is their shot at a very specific kind of immortality, and they seem to be in subtle competition with each other to write the one marriage equality opinion that history remembers. 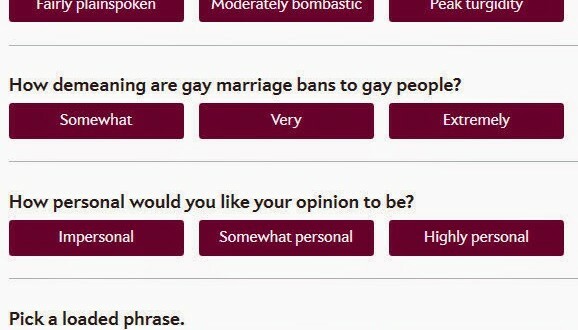 Now Outward is offering a chance to create the ultimate gay marriage opinion. We’ve taken the most notable portions from a number of these opinions; just choose the style and substance of your ruling, and we’ll give you an opinion to match. Every sentence is taken from a real gay marriage opinion, though some are lightly edited.